For those who aren’t members of the Vermont Paddler’s Club, below is an article I wrote for their yearly publication about the Otter Creek Race Series I started this summer. Arriving in Vermont in February after three months paddling in South America, it was hard for me to accept that paddling season here isn’t year round. My sheer refusal to stop kayaking was met with much skepticism, but naysayers were soon silenced as I discovered that Otter Creek Gorge (in Middlebury) is runnable every day of the year. It, along with Sumners Falls on the Connecticut River, is one of the only stretches of whitewater that is never too low. And while I haven’t tried to paddle Sumners in the dead of winter, I imagine there’s some concern about ice blocks floating downstream. Christian Woodard stoically scooches upstream on Otter Creek in February. Anyway, like the addict I am, I dutifully paddled at least three days a week on Otter Creek until the last throes of winter, and even after, as spring never truly sprung until July this year. 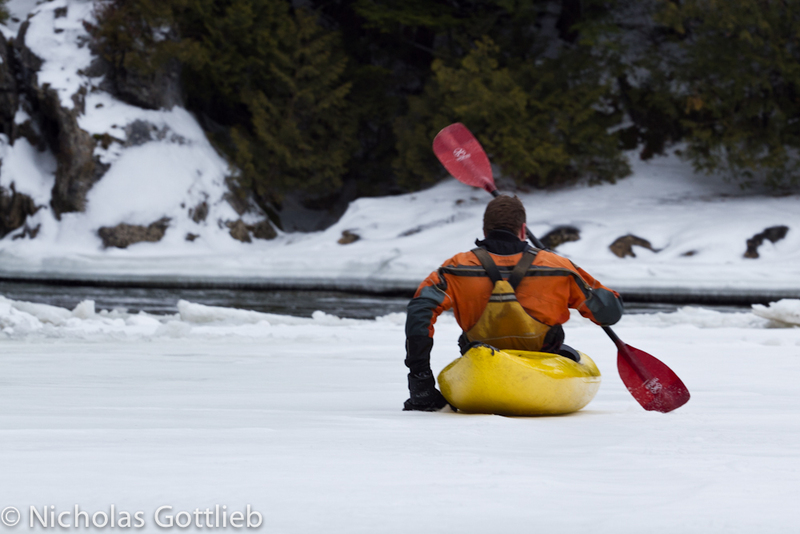 In all that time, I saw no one out on Vermont’s premier winter paddling resource other than a small handful of Middlebury local paddlers (read: whoever I could drag out). I was shocked – why was no one else taking advantage of the single year-round whitewater resource we have? I mean, I know it’s not the Little White, but any whitewater is better than no whitewater, right? Daphnee Tuzlak reaps the rewards of scooching and hiking up this VT gem. So, in an effort to shine a light on this hidden treasure, once the summer rains ran out, I started a weekly race series on the Gorge. Initially, the plan was to have each week’s winner define the format for the following week, but after a mixup where we allowed Mike Mainer to decide the format, we decided to have the format be the same every week: a mass start facing upstream (a la Lozer Cup on the Deerfield Dryway) from Belden’s Falls (the put-in) to the campground. Hanging out at the end of the first race. The race hasn’t been limited to Otter Creek, either. Thanks to Ryan McCall’s contacts at GMP, we’ve been able to schedule a handful of releases on the Little River in Waterbury, which has lured out some members of the elusive Montpelier paddling community. I hope in the future that it will be something of a traveling race series – based on Otter Creek, but with races on other rivers if the water level permits. 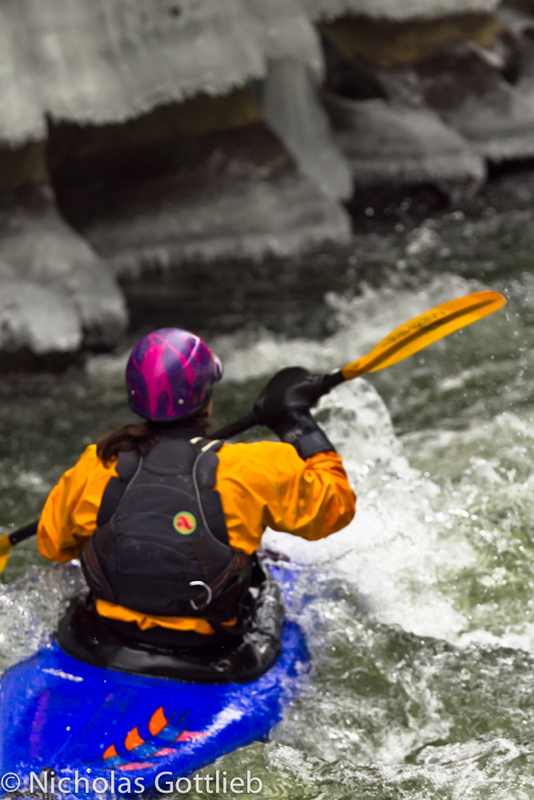 Racers are hoping for a Mad River race before the river freezes over. The race season thus far has been an emotional rollercoaster. 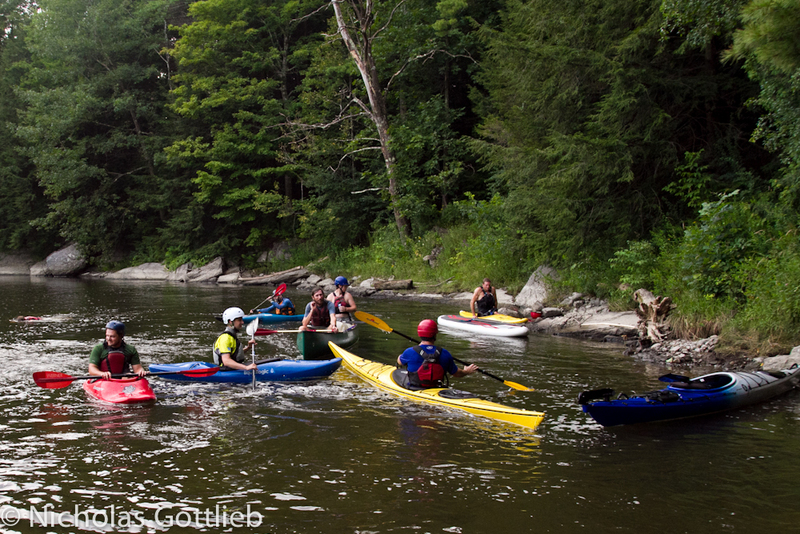 One week saw 19 participants – some folks must’ve driven from out of state because I don’t think there are 19 paddlers in Vermont. Another saw two. Week-in, week-out, through ups and downs, one thing has remained clear – that people will paddle fast if there’s a six pack on the line! And, on a more serious note, it’s really been great for the community – even in times of no water, we’ve all been getting out and enjoying ourselves paddling together in an area where paddlers are few and far between. While I expect the number of regulars to dwindle (from two down to one) as winter returns, I plan to continue the race well into the fall, if not through the winter. Even if we’re not racing, come down to Otter Creek and you’ll see me out there scooching across icebergs on my way down the river. Update since this article was written: as of now, we are doing the races on an ad hoc basis — sunset on weekdays is too early to expect people to come out, but we have had occasional weekend races and will continue to do so, so if you find yourself in VT, don’t let the fact that it’s winter fool you; come out and paddle.